T he ability to freely move throughout society and participate in all governmental services and activities is a right of every individual. The ERC works to ensure government entities do not discriminate against individuals with limited English proficiency when they seek access to government benefits, activities, services and programs. Since our founding, the ERC has achieved a number of landmark victories, improving language interpretations services for those with limited English proficiency. In addition, the ERC continues to advocate for compliance with the DC Language Act of 2004 to ensure non-English speakers have access to local government services. Learn how D.C. agencies fare with providing language access to individuals with limited English proficiency. S ince the ERC’s founding over 30 years ago, we have remained committed to expanding the protections of civil rights laws, including laws extending protections to the lesbian, gay, bisexual, and transgender (LGBT) community. A growing number of states, the District of Columbia, and localities include sexual orientation or gender identity as a protected class in housing, employment, public accommodations, government services, and otherwise. New doors are opening every day, yet much work remains to ensure equality for those in the LGBT community. Learn more about state public accommodations laws affecting the lives of LGBT people & policies. Read the first comprehensive national transgender discrimination survey. 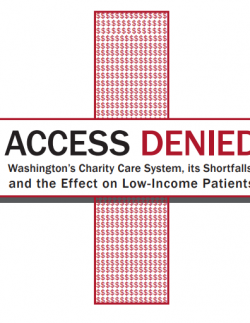 In August, 2017, Columbia Legal Services released a report titled Access Denied, which documents that hospitals across Washington State are not meeting legal requirements to provide free or reduced care to thousands of eligible patients. The report is based on a language access testing investigation conducted by the Equal Rights Center. In April, 2016, ERC released a report titled Room for Change, which was made possible by a generous grant from the New York based Arcus Foundation, a charitable foundation that focuses on issues related to LGBT rights, social justice and conservation. 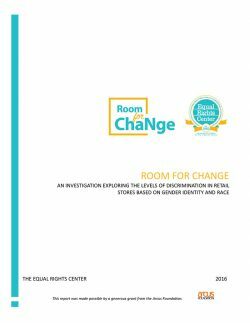 This report focused on evaluating the level of discrimination transgender women face in retail stores.